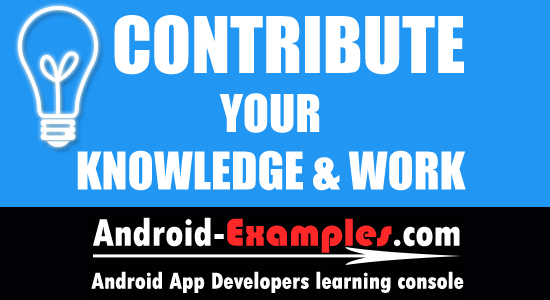 Message From Founder of Android-Examples.com : Android-Examples.com is a part of myself and from a year i was updating it by myself by creating new android development tutorial twice a week but now i am offering you to an opportunity to become a part of my blog and serve your best knowledge work with thousands of peoples around the globe. 100% original content written by user himself including all the code and screenshots. Product must be original and not copied from any where. Also before creating any tutorial check our website’s search box so you don’t have to create already published tutorial on same topic. Article must be above 300 words and easy to understand with brief topic information. We do not allow backlinks. Copyright : By submitting a post to Android-Examples.com , you give us copyright ownership of the post. Every developer who wish to contribute their work with us have to send their tutorial with all the sample code including whole project itself , screenshots on our email : [email protected] . First we will check it that it is 100% original then we will published your tutorial on our website. We will give you all the credit you need and for that you have to send your pic along with tutorial and some basic bio information about yourself which will show just the end of your tutorial.